The presidency of football’s governing body FIFA is set to contested on June 1st, with current supremo Sepp Blatter being challenged by Asian Football Confederation (AFC) chief Mohammed Bin Hammam. With controversies, accusations and scandal in the world game over the last year, who is the right man to bring dignity back into the sport and lead the the organisational committee forward? With match fixing allegations, rumblings of bribery at the highest level of the game and the debate over the use of technology in the sport, FIFA have a lot on their plate. 75 year old Blatter has held the post as the most powerful man in football for 13 years, and had his successes in that time, but recently he has been lamented in the media and is seemingly becoming more unpopular. Despite the general distaste for the Valais born official in the press, he has been publicly backed by a number of leading football organisations including African ruling body CAF, its North and Central American equivalent CONCACAF and CONMEBOL, who govern the South American game. The latter of the organisations support was potentially in doubt following Blatter’s comments in the media questioning Brazil’s progress in preparation for the 2014 World Cup, but it has been reported that all three mentioned governing bodies and their Oceania (OFC) and European (UEFA) equivalents are set to vote in unison on the current president’s behalf. The previously reserved Qatari Bin Hammam has levelled personal attacks on his opponent since the decision to run for the role, stating that it is time for a change whilst questioning the Swiss’ leadership. 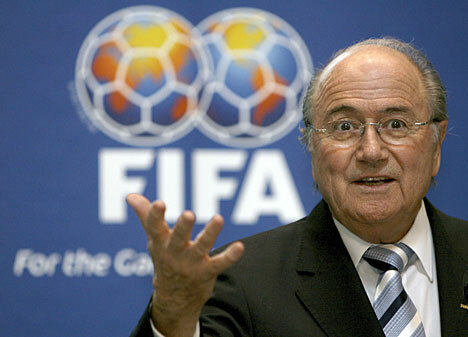 The 62 year old has denied allegations of corruption within FIFA, specifically surrounding the rumblings of bribery in the award of the 2022 World Cup to Qatar. The AFC president has vowed that a change will benefit the image of FIFA and has vowed to bring in new ideas such as the introduction of goal line technology, a ‘transparency committee’ within the organisation to oversee the daily activities of FIFA to stamp out any irregularities and an increase in funds to underdeveloped or underprivileged footballing nations – all initiatives that would surely benefit the game. Despite this, anything other than Mr Blatter being retained as the main man of FIFA would be a huge shock, as the powers that be in the respective ruling bodies are accustomed to the president, with the current cloak and dagger nature of football’s governing body set to continue. Whether Blatter’s continuation is a good or bad thing for the sport will be decided in years to come, but football’s decision makers look likely to back the devil they know rather than an unknown entity.